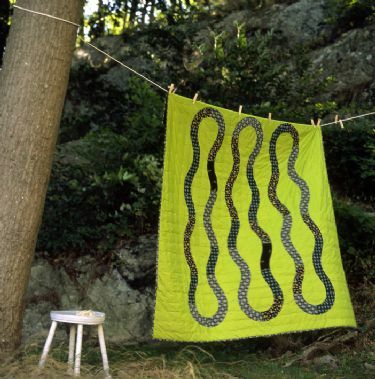 Our quilts are designed and made by hand to be used as bed coverings. They will withstand gentle wear and tear, but please handle with care as you would any fine textile. Avoid direct sun to maintain color intensity. To remove fold lines or wrinkles from shipping, steam with an iron or spritz lightly with water and allow to dry flat. Do not store in poly bags. Couture quilts may be washed in cold water, by hand in a large sink or tub, or in your washing machine (gentle cycle) with a gentle quilt soap*. Agitate manually for best results. Carefully lift wet quilt from washer. Fibers are most vulnerable when wet. Lift and carry wet quilt in a sheet to avoid stretching and weakening fibers. Place in dryer on air for 15 minutes to remove some moisture, then dry flat. Do not wring or hang wet quilts. Washing will accentuate the texture of the hand quilting. Dry cleaning for cotton quilts is not recommended. Quilts may also be vacuumed between cleanings to remove surface dirt. Custom quilts (made with fabrics other than cotton) and the Wool and Cotton Collection are dry clean only. To remove wrinkles or fold lines, spritz lightly with water. Allow to dry flat. Works Cotton Collection and Special Edition quilts may be washed in cold water with a gentle quilt soap on a gentle cycle, and dried on low. For best results, remove from dryer immediately. *We recommend Engleside’s All American Quilt Wash or Soak.